The Dogfish Head Festina Pêche is a Berliner Weisse beer, a fairly rare wheat beer, made slightly more popular lately with German breweries resurrecting this almost lost style of beer. This beer is made with top-fermenting yeast and lactobacillus culture to give the beer a distinctive tart and citric flavor. The beer pours well with a huge head with a standard 45° angle to vertical. Beer is light straw color, very clear. Initially pour with a think white head, which quickly dissipated to a thin white layer. Looks highly carbonated with lots of bubble quickly rising from the bottom. The aroma is light, fruity, and tart. Dominated up front by a fruity peach flavor, which quickly swings to a dry, crisp, tart effervescent mouth feel. The tartness lingers for a long time, coating the mouth, building over each sip. Tart and Dry. 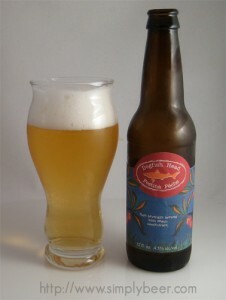 I found that the tartness of the beer was better balanced by the peach flavor as it warmed up slightly to about 50°. I tried this a little while ago, and at the time found it too tart, too dry. But I was drinking it very cold, and I think you are right that letting it warm up a bit would balance out the tastes/flavors. I think I have one more left in my storage, so I’ll have to try that.